Bill and Wendy Bradford are suppliers of DITI equipment. Bill stresses that Digital Infrared Thermal Imaging is not designed to replace mammography: he explains more about thermal imaging and how he believes it should be used as part of a comprehensive programme of early detection for breast cancer. Over 90% of women diagnosed with early stage cancer are alive 5 years later, yet only 58% of cancers are diagnosed at this stage. Digital Infrared Thermal Imaging is helping to address the early detection of breast abnormalities up to 10 years before mammography. Digital Infrared Thermal Imaging is already an adjunctive test for the early detection of active breast abnormalities / cancer. It has come of age with the advent of lower cost, highly sensitive infrared cameras and powerful computing programmes, along with standardised protocols. DITI captures and processes individual temperature measurements in each quick scan with the accuracy of 0.1ºc. Statistical software is used to aid interpretation. If the scan indicates thermal asymmetry of the breasts (neovascularity accompanies early cell changes) then further investigation and monitoring is required. 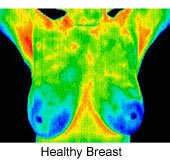 Digital Infrared Thermal Imaging is not designed to replace mammography; anatomical tests or self-examination; its role is to stratify the risk, so that the right group of women can be carefully monitored until a lesion can be detected by mammography and/or other anatomical systems, then biopsied or clinically correlated. However, using DITI as an interim test will reduce the exposure of ‘healthy’ women to Mammography radiation until absolutely necessary. In the USA, William Hobbins demonstrated in a sample of 37,050 patients a yield of 56 cancers per 1000 abnormal Thermograms as compared to the 5.6 per 1000 in the BCDDP studies utilising mammography. (i) It is effective for all age groups, especially younger women with denser breast tissue who are not automatically catered for by government funded mammography schemes. (ii) It is non-contact and non invasive thus painless for women and, because it does not emit any radiation there is a very high acceptance for this test. (iii) It is also effective where implants are involved. Thermal emission is not adversely affected and as there is no contact, there is no danger of implant damage. It is ideal for post-operative use to monitor treatment response. (iv) Ideal for use with small-breasted women where mammography is difficult. This is also relevant for men as almost 1% of all detected breast cancers are in male patients. (v) Mammography is only able to X-Ray the quantity of the breast that can be fitted into the screening clamp table whilst Digital Infrared Thermal Imaging is able to view the whole area of the breasts. This includes the lymph zones from the chin to beneath the breasts and under the arms, Carotid arteries and Thyroid. Breast screening using DITI does NOT require a cold stress test. Why would I want to use Thermography for breast screening? Mammograms are a good tool for determining the exact location of a developed tumor, but it is not an early warning system, which some women assume that it is. “Early” is a relative term, so if a mammogram can see it in the 8th year, it is earlier than the 10th year, but in any case, even the 7th year is too late to change the outcome. The real danger of breast cancer is whether or not it has spread to a vital organ. If it is going to spread, it has had many years to do so. We deserve earlier detection, and this is it. Thermography can see the blood supply that feeds a tumor in its infancy, and the only way to detect it in that stage is to establish a thermographic baseline and monitor every year for the real early signs! Thermography can totally change a person’s health history in advance. Please encourage your friends to protect themselves on a whole new level. PLEASE NOTE: Meditherm no longer offer Thermography sessions, they only sell the equipment.